One very lucky punter managed to hit the jackpot on Microgaming’s Major Millions Video Slot game on Tuesday, 25th August, 2015 which resulted in the player winning a massive, life changing amount of $1,166,358. Details of this huge win have not yet been revealed but it has, however, been confirmed that this is the 28th win for the Major Millions jackpot since 2009. The Major Millions Video Slot game pays out an amount of $570.228 on average and although this time the video slot game went 20 weeks in between wins causing the jackpot to rise to this very large amount, it is usually hit every 10 weeks. Major Millions is a progressive jackpot slot game designed by Microgaming, one of the highest recognized providers of online casino software. The 5 reel, 15 coin slot game with 15 pay lines is linked up with the 3 reel version of Major Millions in order to produce a combined jackpot. The Scatter Explosion symbol in the Major Millions progressive slot game can show up anywhere on the five reels to complete winning scatter combinations if three or more of them show up on the five reels. The Major Millions symbol is the wild symbol that serves as a substitute to complete winning combinations for everything, with the exception of the scatter symbols. 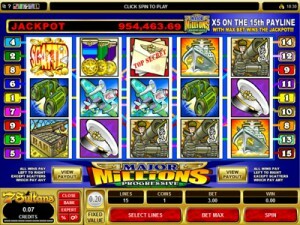 Wins are tripled if the combination was made with the assistance of the Major Millions symbol. Five Major Millions symbols (wilds) appearing on any enabled pay line from pay line 1 to pay line 14 will result in a payout of 8000 coins. Should five Major Millions symbols appear on the 15th pay line it results in an instant win of the progressive jackpot which starts at $250,000.